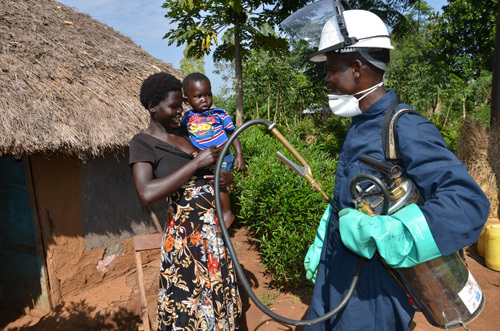 Malaria is the leading cause of morbidity and mortality in Uganda. Accounting for 30 – 50 percent of outpatient visits and 15 – 20 percent of hospital admissions, malaria places a huge burden on the Ugandan health system. Recent PMI-supported activities include: IRS in high burden eastern and east central districts with persistently high malaria prevalence rates; ITN distribution via ANC/EPI clinics and school outlets as well as social marketing of nets at a subsidized price; training and supervision of health workers in integrated management of malaria including malaria in pregnancy; collection of surveillance data; management and monitoring of insecticide resistance; and behavior change communication activities that reach millions of Ugandans with key malaria messages. The PMI VectorLink Project aims to contribute to PMI’s goal to halve the burden of malaria in 70 percent of at-risk populations in sub-Saharan Africa. The project will continue to work closely with the Ministry of Health, the National Malaria Control Programme, district health offices, local NGOs, and community leaders to ensure that government, the private sector and communities are able to sustain and lead future IRS and malaria control programs in their respective countries.